The Scottish Football Association will vote for Dutch football chief Michael van Praag in the forthcoming Fifa presidential election. It backed Sepp Blatter four years ago. But SFA president Campbell Ogilvie said: "We agreed to support Mr Blatter in 2011 on the proviso this would be his last term in office. "We believe Michael has the experience, integrity and gravitas required to expedite the modernisation of world football's governing body." 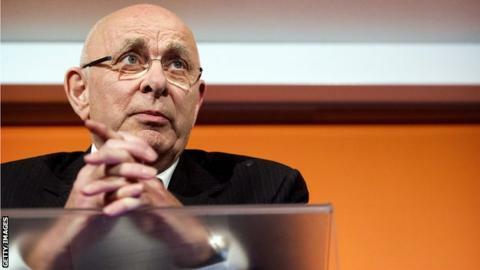 Van Praag, president of the Royal Dutch Football Association (KNVB), has named Scotland among six countries who are backing him against incumbent Blatter for the top job at world football's governing body. "Having known him for more than 20 years, I believe he is the right candidate at the right time to restore harmony to the game," said Ogilvie. "We also remain in favour of a term limit for the role, in keeping with good governance." Speaking at a news conference at the Amsterdam Arena to launch his campaign, Van Praag said he had also received nominations from Belgium, Sweden, Romania, the Faroe Islands and the Netherlands. He also said he would only stand for one four-year term if elected. Candidates need five nominations from national federations to officially stand for election as president. Former Portugal midfielder Luis Figo, the 2001 world player of the year, has also claimed the support of five federations. Van Praag has promised to modernise Fifa, expand the World Cup with more places for non-European countries, and give Blatter an advisory role.